There will be an in-store discussion of Cosmopolis by Don Delillo on Sunday, February17th. Each month, the Elliott Bay Book Club reads and discusses the best in contemporary fiction with the occasional classic thrown in for good measure. For February, we turn our attention to Point Omega by Don Delillo. In this potent and beautiful novel, Delillowhich The New York Times calls "prophetic about twenty-first-century America"looks into the mind and heart of a scholar who was recruited to help the military conceptualize the war. We see Richard Elster at the end of his service. He has retreated to the desert, in search of space and geologic time. There he is joined by a filmmaker and by his daughter Jessicaan "otherworldly" woman from New York. The three of them build an odd, tender intimacy, something like a family. Then a devastating event turns detachment into colossal grief, and it is a human mystery that haunts the landscape of desert and mind. "Point Omega has a vortex quality to itmonths after reading it, it still knifes through time, still charms, still resonates and forces me back to the core. This is the one that takes the skin away, that swings at the deep, raw edge." - Colum McCann. "This is a beautiful bookthe most surprising and structurally satisfying that Delillo has written. By slowing down and examining, frame by frame, the high-speed video violence in which our world is saturated, Delillo penetrates more deeply into the mystery of our mortality than you would have thought it was possible for anyone to go. His entire long and brilliant career is encapsulated here, intensely, movingly." - Jonathan Franzen. DON DELILLO discusses PONTO OMEGA. Chicago Public Library discusses Falling Man. 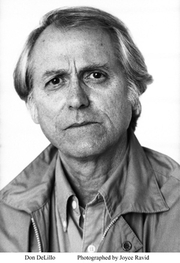 Don DeLillo is currently considered a "single author." If one or more works are by a distinct, homonymous authors, go ahead and split the author. Don DeLillo is composed of 22 names. You can examine and separate out names.